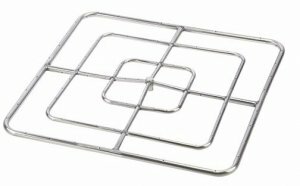 48" High Capacity Square shaped triple fire ring. Made with heavy 304 gauge stainless steel to last longer than other rings you can find on the market. Rasied hub and staggered port drilling help to keep rainwater from collecting in the burner and create a more natural looking flame.